Is Emma Frost Going to Die In Marvel’s Infinity Wars Event? Marvel Comics has followed up on its previous Infinity Wars teaser asking, “Who Will Death Claim?” with a new image that might give X-Men fans pause. The new image from J.G. 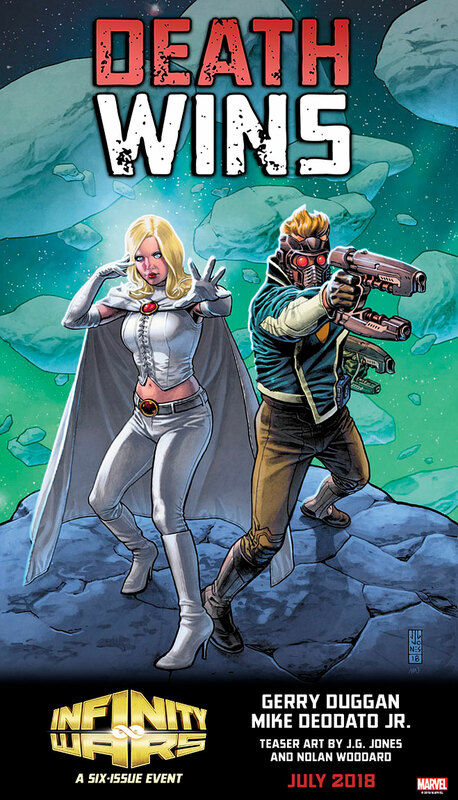 Jones and Nolan Woodard features Star-Lord, who we’ve known was part of the event from the initial announcement, alongside newcomer Emma Frost under the forbidding statement DEATH WINS. There’s no way Marvel would kill the former White Queen… is there? Previous teasers for by Gerry Duggan, Mike Deodato Jr. and Frank Martin’s upcoming event have indicated a number of possible casualties at the hands of new character Requiem, including Captain Marvel and Star-Lord, though this is the first time any of the events’ images have even featured an X-Man. RELATED: Infinity Wars: Who Is Requiem, Marvel’s Newest Cosmic Villain? The original Infinity War series from 1992 revolved around the Magus’ efforts to use the Infinity Gauntlet for his own evil machinations. Though Magus did appear in the run-up to the current Infinity Countdown storyline, he was quickly killed by the event’s true villain – the human/android hybrid Ultron Pym. Below is the official synopsis for Infinity Wars: Prime #1, which arrives in July 2018. The post Is Emma Frost Going to Die In Marvel’s Infinity Wars Event? appeared first on CBR.